Evo.com has created a solid, comprehensive site for all things sporty. 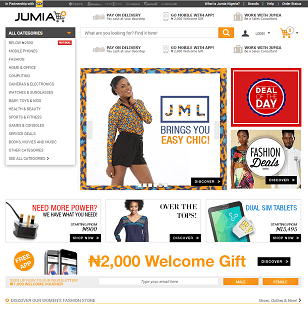 The site has been constructed with ease of navigation in mind, and a customer-centered attitude seems to have informed the manner in which the company approaches the presentation of its wares. 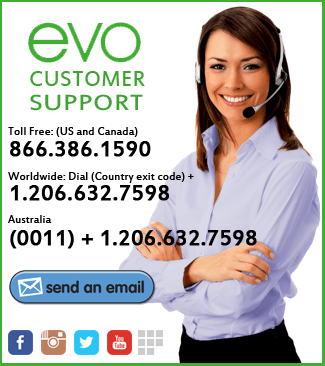 Evo.com is a website that offers a stunning range of gear and apparel for the outdoor-minded consumer. 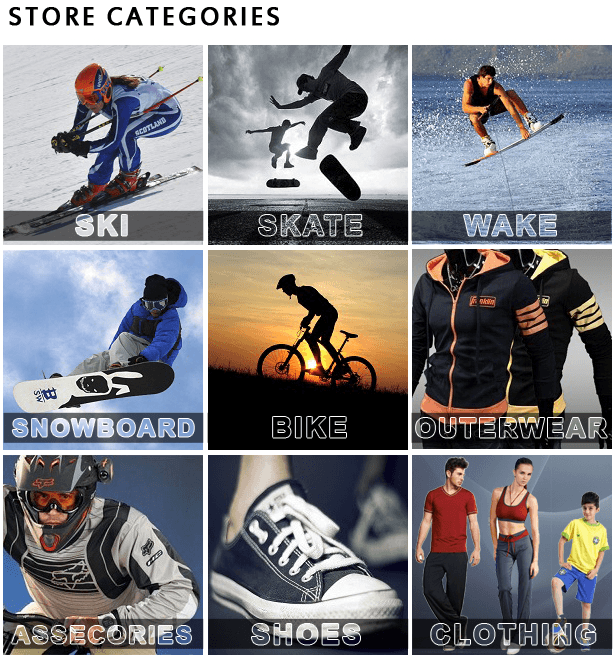 The company offers shopping categories in skiing, snowboarding, wakeboarding, biking, and skating, and clothing options extend to outerwear, shoes, and accessories for men, women and children. The site is a bit modest when it comes to describing its history and mission, but in this case modesty is a virtue, given the cornucopia of sports-related equipment and clothing that has been assembled in one place by the organizers of this online store, which could really be more accurately described as an online sporting goods mall. 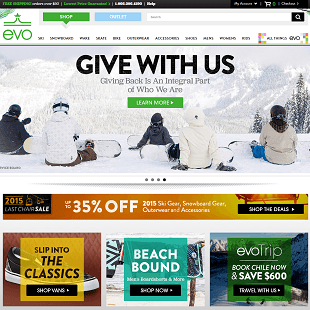 Evo treats outdoor sporting as part of a holistic culture, and as a result, they offer not just their mall, but additional site pages supporting a cultural vision. The culture page includes articles from known and respected winter sports athletes, and news on upcoming events and concerts that the site believes will be of interest to the outdoor-minded. The culture page currently hosts an interview with Level 1 Generation skier Mick Hornbeck, an upcoming Seattle art exhibit hosted by Asymbol, an organization dedicated to providing venues to respected artists within action sports culture. It would be easier to list the sporting gear and clothing that are not contained in Evo’s lineup than the products that are included, but in order to do the site justice, we are going to draw the curtain and show the diversity that is unified under their virtual roof. Looking just at their bike-oriented selections shows categories for bikes (of course), as well as accessories, bags, bells, bike cargo racks, car bike racks, fenders, helmets, lights locks pumps & CO2 inflation, reflectors, grips, pedals, and bike tools. After you take a breath, you are next offered bike-related clothing of every type, including of course helmets and sunglasses. Next, we will peer down the slope at the company’s ski offerings, where we see such predictable categories as skis and their associated boots, bindings, poles and accessories, of course, but also a category for used ski gear. This is a particularly useful place to visit considering the overall cost of skiing. They also offer separate listings for backcountry skiing, helmets, goggles, body armor, tuning and tools, ski racks (to be used when the season for your bike rack comes to an end), and every form of ski apparel, including mid layers and base layers, balaclavas, and neck warmers. Basically, they have everything except hot cocoa, which you can make for yourself when perusing these encyclopedic entries. Wakeboarding, for those who don’t know, is a kind of surfboarding on snow, and it requires its own gear. The company after taking the pulse of this market apparently concluded that wakeboarding deserved an entire product category to itself. They have therefore taken the time and effort to collect wakeboards, wakeboard bindings, related ropes and handles (you use ropes and handles – it sounds fun already), wakeskates (skates! ), and wakesurf boards (which are different from wakeboards, but you’ll need to try the sport out to see how). Naturally they also have every related apparel and accessory item you could think of, from wakeboard vests and helmets to wetsuits, and wakeboard parts and accessories. The firm’s prices are reasonable, but include more highly valued brand items at correspondingly higher prices, and med-level brands at more affordable prices. Wakeboard vests, to take one example, can be had for $39.95, which will buy you an O’Neil Superlite USCG model, or for $119.99, which will get you a Ronix Covert Capella CGA model. One convenient feature is a “deals” link that takes you straight to what they currently have on sale. 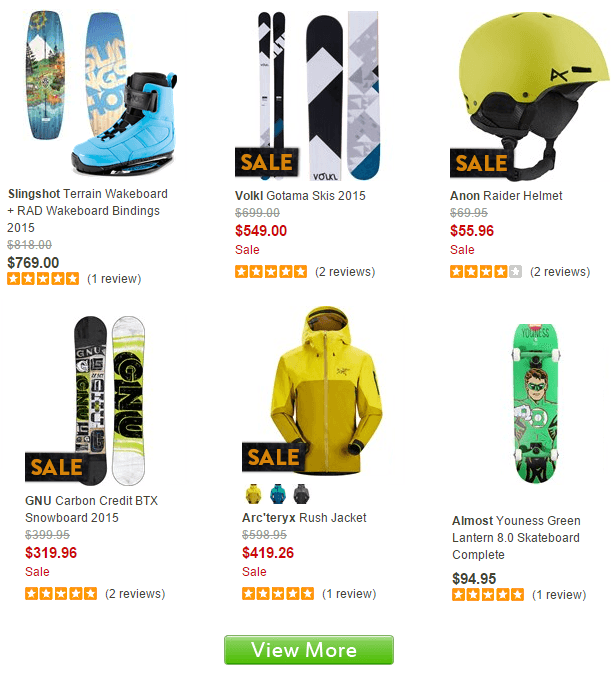 A recent quick peek showed a 30% off deal on winter jackets, pants, goggles, gloves, and more. 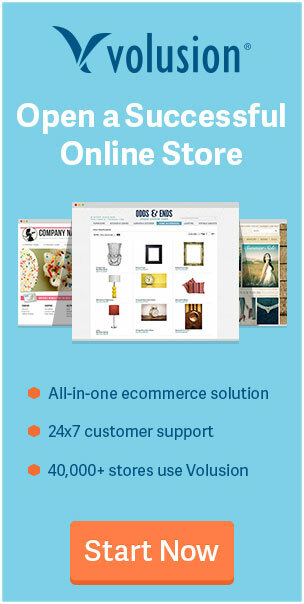 This is certainly the kind of incentive that will bring interested customers to their site, and fortunately, sale offers are a common feature of this online store. Actually, criticism is hard to come by when it comes to this company. They consistently score high ratings for customer service, willingness to accept returns and return processing, and the quality of the goods they offer. While we were able to find an occasional complaint concerning partial refunds offered when full refunds were expected, that is not a consistent theme. 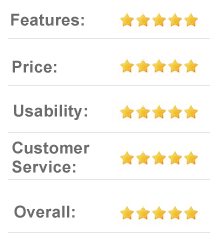 The consistent theme, in fact, is one of general customer satisfaction. The only concern you may want to be aware of is how many other legal entities out there love and have claimed the word “evo” as part of their name. Evo is also a British car magazine, a free-turn based strategy computer game, a Compaq computer, an HTC smartphone, and the first word of a Croatian battle cry (true fact). 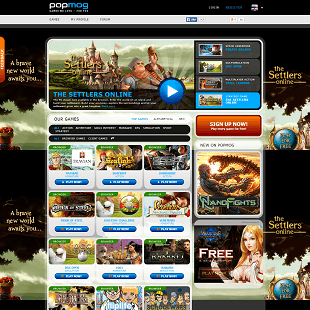 But so long as you stick with evo.com, you’ll get this all-sports, all-the-time online store. The company also offers a lowest price guarantee, promising to provide you with the lowest price possible. If you can show that a competitor has a product for sale online at a lower “final” price, this company will beat it by 5%. The term “final” price includes duties, taxes, and shipping costs, which seems only fair. Also this offer cannot be combined with other promotions by the company. Other requirements for this price matching are that the product be of the same model year, color, size, and condition, and that it be in stock at the competitor’s website. Those caveats seem fair as well. All in all, that’s quite a nice little guarantee to hold in your back pocket, and reflects the company’s dedication to exceptionally low pricing, even of products produced under a brand name that carries a higher cachet. Oh, and if a competitor gives you 10% as part of a membership program, resulting in a lower “final” price, evo will give you the same 10% in the form of a discount, and will allow you to simply keep that money. 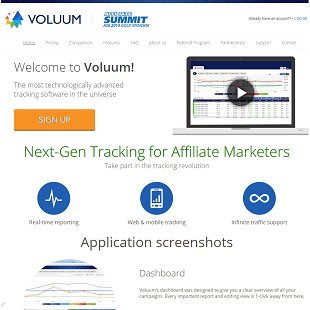 The firm also matches coupon codes and membership refunds, and if explaining everything online is too much of a hassle, you can simply call the store at a toll-free number to work out the details and complete your order. The firm has a customer help page that lays out its phone line hours, how to dial in from outside the country (including a special number for Australians), and that provides details on shipping times, returns, and how to process a return. The page assures you that you will receive order confirmation within 15 minutes after submitting an order, and that economy orders will ship within 2-3 business days, with expedited orders shipping the next business day. You are also provided with shipping confirmation email that includes a tracking number. The page helpfully explains exactly how to use that tracking number to follow the progress of your goods to your home. When it comes to warranties, the customer help page explains that these vary by manufacturer. However, the company offers to mediate any warranty claim based on the warranty that the manufacturer does offer. In other words, if you have a problem, they offer to stand by you as you work it out. The folks at evo.com have created a solid, comprehensive site for all things sporty. 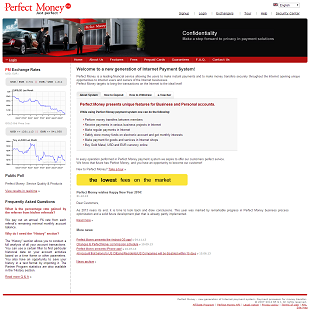 Transparent business practices could be their motto, and the site has been constructed with ease of navigation in mind, and a customer-centered attitude seems to have informed the manner in which the company approaches the presentation of its wares. And given their comprehensive product line, it would be hard not to find what you are looking for as you peruse what this online store has to offer.